For any parent, the safety and well-being of your child is of the utmost significance – and no-where is this more important than within the home. For any parent, the safety and well-being of your child is of the upmost significance – and no-where is this more important than within the home. However, with more and more children now staying inside, most parents want to ensure that their children are playing in a comfortable and happy environment – for example, keeping out the light on long summer evenings and bright mornings (helping to avoid interruption to sleep), as well as ensuring safety when they are playing unattended. Shutters are one way to appease these sorts of concerns. With a simple manoeuvre of the slats you can manage issues such as heat, light and privacy – especially in overlooked urban homes. Moreover, the lack of dangling chords means they are one of the safest options of window treatments – eliminating potentially risky choking hazards. Furthermore, as they are so easy to keep clean (with a simple dusting or wipe of a cloth) they are perfect for the growing numbers of children with dust allergies. You can read more Child Safety on the BBSA’s website. Shutterly Fabulous can make sure that you can find the perfect window treatment for your child-friendly space. And with our colour matching service, you’ll be able to choose from a range of colours and designs – finding the perfect fit for your child’s room. 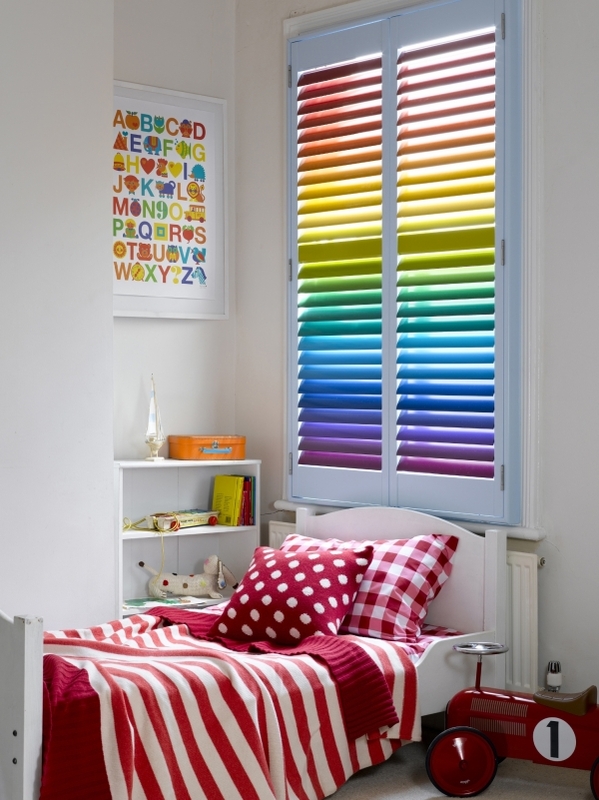 Please note that the Rainbow Shutters featured incur a surcharge, costing approximately 3 times more than regular white shutters, this is due to the complexity of the manufacturing process involved.